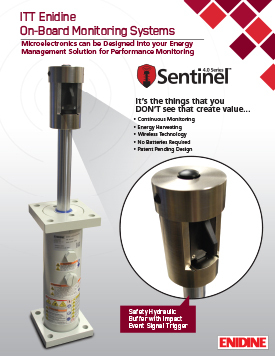 Sentinel™ 1 is ITT Enidine’s first generation on-board monitoring system, these microelectronics solutions can be designed into your energy management and performance monitoring programs. This new patent pending design is the first of its kind in the shock absorber industry, integrating electronics with our already robust heavy duty shock absorber design. This technology incorporates continuous shock absorber/impact monitoring, energy harvesting, wireless technology enabling long range (over 2,000ft) communication across a facility to a PLC or similar system all without batteries or wires required, this makes for easy adaptability into an already installed base of shock absorbers. This truly standalone, safety minded hydraulic buffer with impact event signal trigger capability protects people and goods in applications such as ASRS, Warehousing, Overhead Crane and Amusement Ride End Stops. As a cost effective entry level system designed with affordability and longevity in mind, manufacturers, OEM’s and integrators now have the ability to incorporate next generation IoT 4.0 technology into their designs without the burden of heavy cost overhead and product or system modifications. ITT Enidine’s complete line of Sentinel™ technologies are just the beginning in offering real-time predictable machine maintenance to the global shock absorber marketplace.